Social justice. Education. Healthy communities. The environment. Regardless of the issue that moves you, funding nonpartisan civic engagement offers a powerful approach to winning change that can help advance your mission. 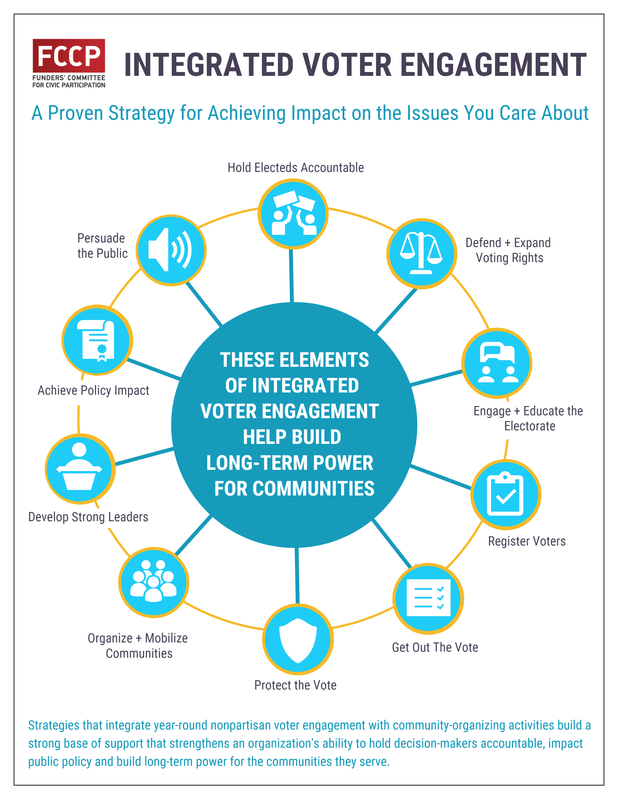 Grantee strategies that integrate year-round voter engagement with community-organizing activities help build a strong base of support that can strengthen their ability to hold decision-makers accountable, impact public policy, and build long-term power among the communities they serve. This three-hour, hands-on, in-person workshop designed exclusively for grantmakers will draw on decades of experience from within the FCCP network. 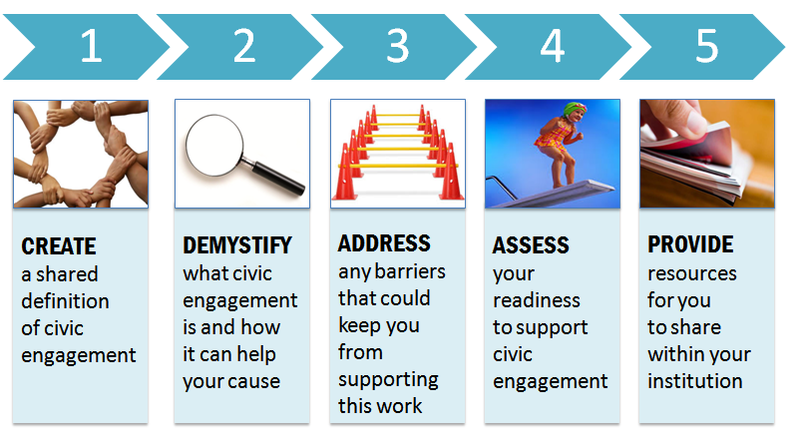 Through a mix of interactive activities and takeaway resources we’ll help you assess your institution’s readiness to begin funding civic engagement and address any barriers that you face in getting started. By the end, you’ll leave with concrete next steps and the resources you need to put them in place. Contact FCCP to learn where our next workshop will be or to explore bringing a Civic Engagement Matters workshop to your community. New to funding civic engagement? Get started with this collection of fact sheets, self-assessment tools, case studies, sample grantmaking documents and more! What is Civic Engagement and Why Does it Matter? What is Integrated Voter Engagement (IVE)? FCCP Website: (http://funderscommittee.org/) FCCP is a Council on Foundations-recognized philanthropic affinity group that brings together grantmakers committed to enhancing democratic participation in all aspects of civic life. Learn more about FCCP’s vision and leadership, connect with our nationwide network of civic engagement funders, and engage with our signature programming and resources. NCRP Website: (https://www.ncrp.org/) National Committee for Responsive Philanthropy (NCRP) promotes philanthropy that serves the public good, is responsive to people and communities with the least wealth and opportunity, and is held accountable to the highest standards of integrity and openness. Tool: The Foundation Funding for U.S. Democracy database tool (by the Foundation Center) This free data visualization platform for anyone interested in understanding philanthropy’s role in U.S. democracy can help you understand who is funding what, where and in what amounts. PhilanTopic Blog Post A Look at Three States and the Role of Civic Participation Funders (By Eric Marshall, FCCP) A look inside the Foundation Funding for U.S. Democracy tool uncovers some important lessons for grantmakers that seek to make smarter grantmaking decisions that amplify the effectiveness of limited civic participation dollars. The data paints an interesting picture of three states — Arizona, California, and Texas — that share some common elements but are characterized by widely differing philanthropic landscapes. Webinar: Civic Engagement: Choose Your Own Adventure (by National Committee for Responsive Philanthropy) Elections, voting, organizing, activism. These are powerful tools for everyday people to shape the decisions that affect our lives. Yet too often, the deck is stacked against the communities who need access to these opportunities the most. How can grantmakers take advantage of the full civic engagement infrastructure? View slides. Report: Bolder Together 2: Lessons for Philanthropy from a California Initiative to Build Grassroots Movements for Change (by California Civic Participation Funders) This report captures key takeaways gleaned through the initiative’s work with local organizations in four large counties that are undergoing dramatic demographic shifts: San Diego, Orange, San Bernardino and Riverside counties. Report +Toolkit: Environmental Success through Democracy Reform: A Win/Win Toolkit (by FCCP’s Money in Politics Working Group in partnership with the Environmental Grantmakers Association and Health and Environmental Funders Network) This report and toolkit furthers the growing philanthropic conversation about the need for deeper investments in repairing our democracy so that we may ultimately repair our environment, too. Advocacy Profile: How Funders and Advocates Won Paid Sick Leave for Workers in Oregon Arabella Advisors, in partnership with the Rockefeller Family Fund, looked at how a range of funders and allies worked together to secure reforms that have influenced the national conversation on our country’s workplace policies, elevating them as topics in the 2016 presidential elections. Case Study: Ending the Era of Mass Incarceration: How the Power of 501(c)(4) Spending Propelled California’s Proposition 47 Funders who aspire to generate transformational policy change can glean valuable lessons from collaborative efforts that employ a range of advocacy tactics and vehicles—including both 501(c)(3) and 501(c)(4) strategies. Together, this range of efforts brought sweeping sentencing reforms and stands as a groundbreaking victory in the movement to end mass incarceration.